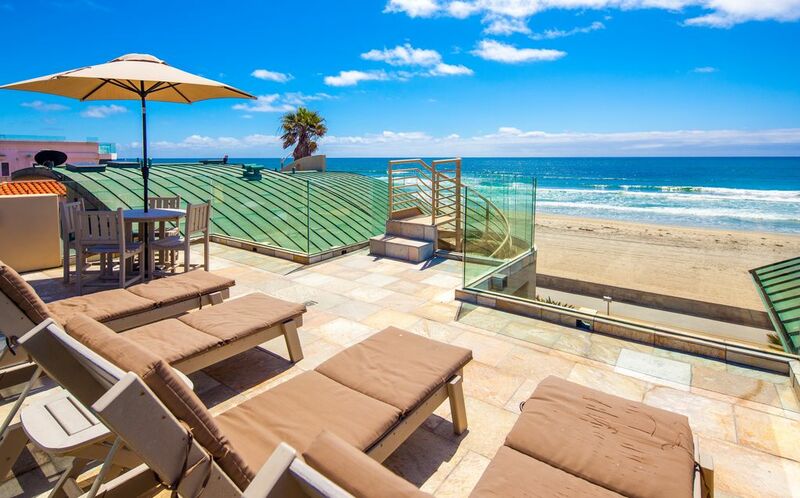 Surf Rider Condo with Private Rooftop Deck! We have the best location in Mission Beach! We are just steps away from the boardwalk, sand and ocean, yet the horseshoe shape of the Surf Rider building offers occupants privacy as well. This unit even has its own rooftop deck for a spectacular and secluded view. The property underwent extensive renovations in 2004 and includes the most modern amenities. Granite floors and counter tops, travertine tiled bathrooms and showers, gas stoves and a very large flat screen TV! The Surf Rider contains a central patio with plenty of room to hang with your friends and/or family and enjoy the view. It is also the only building in Mission Beach with a hot tub right on the boardwalk! Lounge chairs and BBQ grills also adorn the patio, so you can take a break from the beach but still enjoy the ocean. Dolphins and sometimes even whales play in the waves just in front of the condo out in the surf. People watching is great too! From surfers in the water to people making their way along the boardwalk there is always something fun and interesting to see! Many attractions are within walking distance, including Belmont Park, the famous Wave House with its fitness center, spa and wave machine, as well as many great restaurants and boutiques. If you want to venture a little further away, Sea World is only 2 miles away and the San Diego Zoo is about 8 miles away. One of the greatest things about San Diego is the micro communities with their own distinct styles and personalities. From our condo it is quick and easy to get to Pacific Beach, La Jolla, downtown's Gaslamp Quarter and so many other great spots! 5 1/2 Stars. The views from the front window and roof top terrace are wonderful. The condo was perfect for our family of 6 adults. The kitchen is well appointed, and a Ralph's grocery store is close by so we had what we needed. Of course, there are restaurants within walking distance when we didn't feel like cooking. One night we even used one of the outdoor gas grills. We were looking forward to using the fireplace and were disappointed that it didn't work, and the door lock was annoyingly difficult to operate. The negatives were minor. We will definitely consider staying there again in the future. We spent about 4 days at Surfrider over the Thanksgiving break. The unit is located right on the boardwalk/beach. We are a family of 5 and it was just right. Dominique was very responsive to a few minor items that came up. It is really great for families as well walkable to Belmont Park and a lot of restaurants. The unit really had everything you needed for a few days at the beach including beach toys, beach towels, plenty of extra pillows & blankets and the coffee, chocolate and wine in the welcome basket was a really nice touch. Thank you for having us and we will definitely be back. This condo is centrally located, and stocked with everything we needed! We loved the roof top deck and the hot tub. We will be back!! We had just the vacation we wanted staying here...peaceful, sun and beach! The location was great, just a short walk to restaurants, bars and Belmont Park. Literally steps to the beach! We can't wait to go back! Smaller than it looks but clean and good location There were some issues, probably just bad timing.....necessary maintenance/construction work that was loud. Battery that went out on the motorized privacy blind (lost our view for a couple days) and loud party people next door that kept us awake until after 2 am. Our text to Dominque on the noise and blinds was not received for a couple days. Otherwise, we enjoyed our stay here. Next time will probably try to find something a little more private and quiet....a little bigger too! Our family has been vacationing at Mission beach for 14 years. This location was the perfect fsmily get away, equipped with jacuzzi, BBQ, and amazing private rooftop deck overlooking the. Boardwalk and ocean. We have a vacation rental ourselves, so we appreciate the value of other property managers. They were really top notch. The condo was clean, amply stocked, and had great views. Peak summer dates book weekly only (Saturday to Saturday). Monthly rentals are only available during the winter months. Individual quotes will be provided for inquiries.